1. MOST CLICKED LINK: Traveler Knit Infinicowl Scarf Pattern from Mama in a Stitch – This oversized scarf looks so cozy! 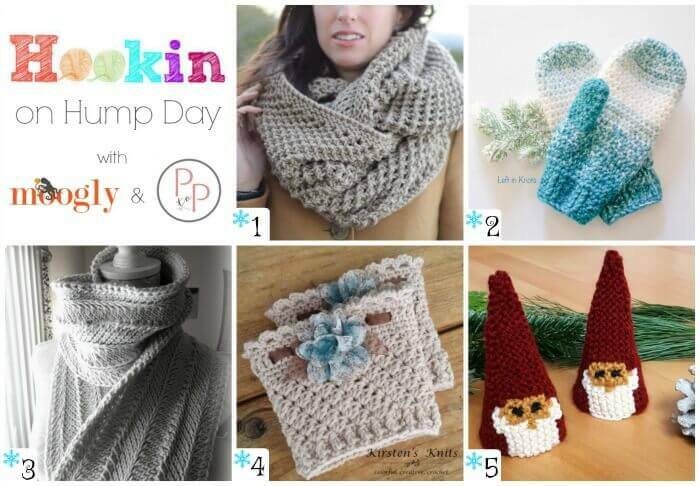 And best of all you can get the knit pattern for FREE! 2. Warm Wool-ish Mittens from Left in Knots – Crochet up these pretty mittens with less than 1 skein … FREE crochet pattern! 3. Tunisian Ripple Scarf from Morale Fiber – This stylish ripple scarf can be easily whipped up with the FREE Tunisian crochet pattern and video tutorials! 4. Ribbons and Grace Ladies Bootcuffs from Kirstens Knits – These boot cuffs are simple and feminine … FREE crochet pattern! 5. Garter Stitch Gnomes from Knitting and So On – Stitch up these adorable little gnomes to decorate your indoor gardens … FREE knit pattern! How lovely to discover this blog too! Thank you so much to host this fabulous Parties! My Josephine Shawl Crochet pattern is here too!